I've discovered that even if I do not have an e-reader, I can still take advantage of the free ebooks offered by several publishers in celebration of Read an E-book Week. You just need to download Adobe Digital Editions (get it here) and then download your free e-books there. Later, if you decide to buy an e-reader, you can transfer your library items onto it. So take advantage of all the e-book offers out there! 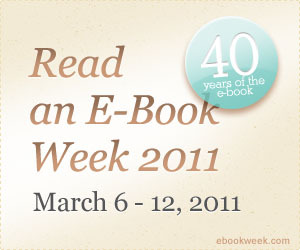 For more information on e-books and other great deals, go directly to Read an E-Book Week Website. Hello. I liked your blog and I am your newest follower. I have a blog. Recently, I published an about women and women`s day. I want to see you in my blog as a follower. Please follow my blog. Thank you.